You must have heard about Regression models many times but you might have not heard about the techniques of solving or making a regression model step-wise. First we will talk about Simple Linear Regression : is a model with single regressor (x) has a linear relationship with a response variable (y). We know make some assumptions on the model. Assumptions in terms of Y[ (ε(Y))] :- Here i am not going in details to write the equation, I will tell you what to do just replace the ε(i) to ε(Y). Here is the Least Square Estimation of the Parameter we are going to discuss further. The parameters β(0), β(1) are unknown and must be estimated using same data. The line fitted by (LSE) is the one that makes the sum of squares of all Vertical discrepancies as small as possible. 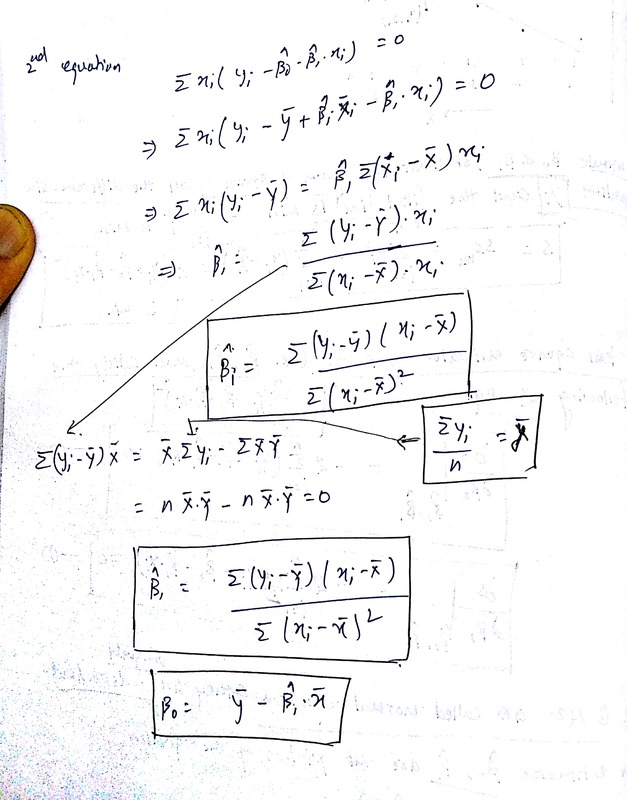 The least square estimator of β(0)& β(1), (β_0 ̂,β_1 ̂ ) must satisfy the following two equation a snapshot is added: Equation 1 and 2 are called normal equations and they are uniquely independent. Above we have calculated the parameters using least square estimator. We have not discussed the benefits of using LSE , in one line the the most important benefits of using LSE is the solution will be most correct almost 95% accuracy. Sum of residuals in any regression model that contains an intercept β_0 is always 0. Both (β_0)ˆ and (β_1)ˆ are unbiased estimator of (β_0) and (β_1) respectively. Which means they should be equal in values. Take the value of beta 1 parameter from above equation. Note:- I am not going to prove this, if you proof need please message me @ irrfankhann29@gmail.com i will personally send my documents. SS(res) = SS(yy) – (β_1ˆ)^2. We got the values of Coefficients, sum of squared errors (Regressor, Regresson and total) using these we can calculate the the null hypothesis which is based on t and z test. if |t|>t[(α/2), (n-2)] we reject null hypothesis. ∴ |t| is calculated value and t[(α/2), (n-2)] is tabulated value. if |z|>z(α/2) we reject null hypothesis. ∴ |z| is calculated value and z(α/2) is tabulated value. Now we have all the values to calculate ANOVA table which will describe in next article, so stay tuned. Queries or Docs/ notes related please shoot me an email on khanirfan.khan21@gmail.com.